In 1978, HSF presented its first preservation award for excellence in restoration. Over the years, with increased interest in preservation, the awards have expanded to multiple categories. Annually, a call for nominations is made to HSF members, and an Awards Committee reviews the nominations and makes the final determinations. HSF was pleased to present the following awards at the January 2014 Annual Meeting that highlight preservation projects in our community. included funding a new transformer in the alley and trenching Augusta Street. 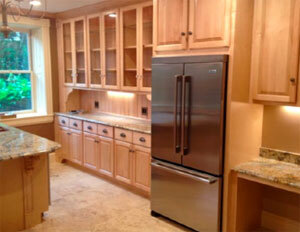 Ray Cubbage and Pam Robbins’ project rehabilitated the original basement level kitchen. The space was designated for a kitchen in the original T.J. Collins drawings from 1898. While the kitchen had been previously remodeled, the space needed to function better and moisture problems needed a solution. Sheetrock and existing floors were removed allowing moisture problems to be addressed. New custom cabinets allowed a partially obscured window to be uncovered, and incorporated the historic dumbwaiter. The new design includes a large glass front cabinet modeled after an original located in the Butler’s pantry on the main floor. Cabinets made of white maple and finished with a clear lacquer and an Italian granite countertop peninsula all reflect traditional construction. Contemporary trim was removed an all new trim custom molded to match the original. This is a new award category developed by the HSF Awards Committee to address excellence in projects that embrace rehabilitation and adaptive reuse in historically commercial areas. The Mt. 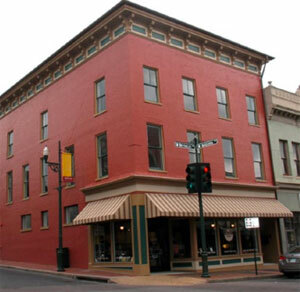 Zion Lodge has worked many years to rehabilitate the exterior of their building on the corner of East Beverley and Market streets. One phase of their work includes the adaptive reuse of a rear court yard area. Following schematic plans provided by the Virginia Main Street Façade Improvement Program, an outdoor dining courtyard was created reusing the existing brick walled courtyard. According to the 1929 Sanborn Map, this area contained a single story building with “firewalls” that housed a large steam boiler. 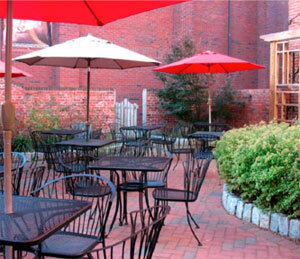 The new outdoor dining area incorporates seating, masonry paving and planting beds within the old brick walls. Such projects enhance the downtown, provide festive communal space and are an excellent examples of adaptive reuse.